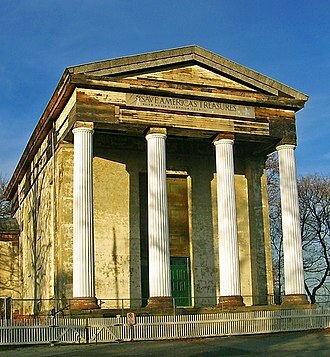 Wikimedia Commons has media related to Historic American Buildings Survey of New York (state). 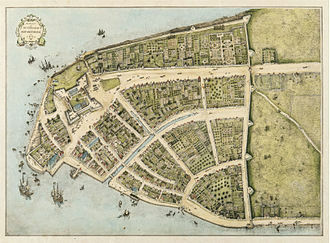 This category contains sites and structures documented by the Historic American Buildings Survey in New York. Pages in category "Historic American Buildings Survey in New York (state)"
They were built by John D. Rockefeller, Jr. from 1926 to 1928 to provide housing for African Americans, the first project of its kind. The buildings were designed by architect Andrew J. Thomas and were named in honor of the noted African American poet Paul Laurence Dunbar, the complex consists of six separate buildings with a total of 511 apartments and occupies an entire city block. The buildings center around a garden courtyard, with each building U-shaped so that every apartment receives easy air flow. The Dunbar is considered the first large garden-complex in Manhattan, the complex was designated a New York City Landmark in 1970, and was listed on the National Register of Historic Places in 1979. The Dunbar Apartments were constructed as an experiment in housing reform, to alleviate the shortage in Harlem. Rather than being set up as rental apartments, the complex was a housing cooperative, tenants were required to pay a down payment of $50 per room, and $14.50 per room per month, much of which went towards a mortgage on the space. In 22 years, if payments were all made on time, the project was both the first large cooperative aimed at African Americans, and New York Citys first large garden apartment complex. The original tenants were primarily middle class, and inexpensive childcare was provided on-site to support working mothers, the building opened in 1928, and the Great Depression began just a year later. The management of the complex was forced to loosen a number of rules in order to allow people to, for example. Even so, too many tenants failed to make their payments and he foreclosed in 1936, and a year the buildings were converted to rental units. In June 2013, the Dunbar Apartments were sold to the Brooklyn-based developer E&M Associates, plans were set in motion to upgrade the facilities and establish the Dunbar as one of the premier upscale complexes in Upper Manhattan. The contract was acquired by Samuel Berry and Andrew Melohn of Douglas Elliman working in conjunction with Fredrik Eklund, noted personalities to live in the Dunbar include leaders of the Civil Rights Movement such as W. E. B.
Anthony House, in Rochester, New York, was the home of Susan B. Anthony for forty years, while she was a figure in the womens rights movement. She was arrested in the front parlor after attempting to vote in the 1872 Presidential Election and she resided here until her death. The house was purchased for use as a memorial in 1945 and it has been documented in the Historic American Buildings Survey. 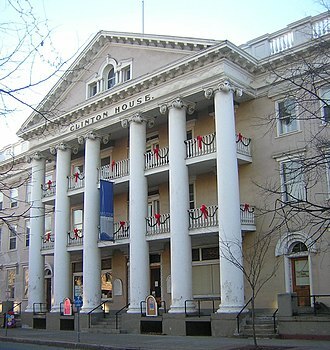 Anthony House is located at 17 Madison Street in Rochester, access to the house is through the Susan B. Anthony Museum entrance at 19 Madison Street, Anthony House is a learning center and museum open to the public for tours and programs from 11-5 Tuesday through Sunday, except major holidays. Its full name is the National Susan B, the Visitor Center and Museum Shop are located in the historic house next door,19 Madison Street, which was owned by Hannah Anthony Mosher, sister of Susan and Mary Anthony. The mission of the Susan B, Anthony House is to keep Susan B. The house hosts a celebration of Nineteenth Amendment to the United States Constitution. The Erie Canal Museum is a historical museum about the Erie Canal, located in Syracuse, New York. The museum was founded in 1962 and is a private, non-profit corporation and it is housed in a weigh lock building dating from 1850, where canal boats used to be weighed when travelling through Syracuse on the canal. The museum includes a gallery of present canal life, the museums Weighlock Building was listed on the National Register of Historic Places in 1971. The Weighlock Building was constructed in 1850 and was known by 1940 as the State Department of Public Works, since 1962, the building has been occupied by the Erie Canal Museum. Market Building was built in a canal basin which extended south from the Weighlock Building in East Water Street. The building was intended as a center for meat dealers. Later, the building was repurposed for city offices and as a place for the public. The front of the building was occupied by a small, fenced grass plot, Erie Canalway National Heritage Corridor New York State Canalway Trail Old Erie Canal State Historic Park Official website Historic American Buildings Survey No. It was built using indigenous stone in 1700 by Daniel DeClark, a Hollander, who emigrated to America in 1676. The date is marked in glazed bricks along the façade, in 1746, West Indies planter Patriot Johannes DeWint and his spouse Antje Dewint bought the house. His daughter, Anna Maria, and her husband, Major Fredericus Blauvelt, the DeWint House became a temporary headquarters of Commander-in-Chief George Washington during the American Revolution. General George Washington was a guest in the south parlor twice in 1780, the Washington Room at the DeWint House is a National Masonic Historic Site. 1780 Washington stayed at the Dewint House while inspecting a redoubt on the Hudson, Major John André was held in the old 76 House in Tappan, a tavern, which is now a restaurant. General George Washington provided meals from his table at the DeWint House to Major John André at the 76 House, a stone on André Hill Road at Gallows Hill marks the site of Andrés hanging. It was said to have been a friendly conference combined with an elegant dinner, samuel Fraunces came up to prepare the dinner for Washington and his guest. 1783 – a terrible snowstorm forced Washington to the DeWint house on his trip to visit West Point, the property was acquired by the Grand Lodge of Free and Accepted Masons of the State of New York in 1932. The site was declared a National Historic Landmark and was added to the National Register of Historic Places in 1966, the site has undergone extensive restoration and upgrading. The houses two rooms have been restored and furnished to reflect the period of Washingtons occupancy. A fully functioning replica kitchen, as General George Washington would have known it while he was a guest of the DeWints, was completed in 1996. An adjacent 19th-century carriage house displays of artifacts uncovered at the site during archaeological digs, as wells as items related to Washington, André and Arnold. A stone mill is displayed nearby and at the rear of house stand 7-initialed headstones which came from a nearby property and it is believed these headstones marked where the slaves of that home were buried. Bath VA Medical Center is a U. S. Veterans Administration hospital located in Bath, Steuben County, New York, affiliated with the University of Rochester School of Medicine, it provides secondary care and operates clinics in Elmira and Wellsville, New York, and Coudersport and Mansfield, Pennsylvania. It was added to the National Register of Historic Places in 2013, the original hospital was established in 1877 by the Grand Army of the Republic. 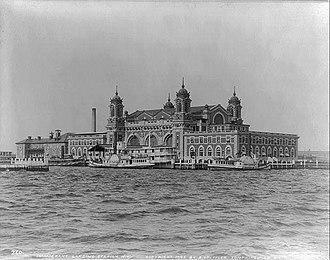 The property was transferred to the State in 1878, greatly expanded and it initially housed disabled New York veterans of the American Civil War, but, as the men aged, it became largely a geriatric facility. The number of residents peaked at 2,143 in 1907, by 1928, the number of residents had fallen to 192. Veterans of the Spanish–American War and World War I were treated at the facility, more than 32,000 veterans received treatment between 1879 and 1932. Adjacent to the home is Bath National Cemetery, where many of its residents are buried, the federal government took over operations in 1929, and renamed it the Bath Branch of the National Home for Disabled Volunteer Soldiers. The Central Troy Historic District is an irregularly shaped, 96-acre area of downtown Troy, New York, United States. It has been described as one of the most perfectly preserved 19th-century downtowns in the with nearly 700 properties in a variety of styles from the early 19th to mid-20th centuries. These include most of Russell Sage College, one of two privately owned urban parks in New York, and two National Historic Landmarks, visitors ranging from the Duke de la Rochefoucauld to Philip Johnson have praised aspects of it. 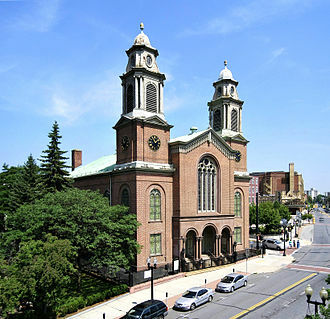 Martin Scorsese used parts of downtown Troy as a stand-in for 19th-century Manhattan in The Age of Innocence, in 1986, it was added to the National Register of Historic Places, superseding five smaller historic districts that had been listed on the Register in the early 1970s. Most of the buildings and objects within the district contribute to its historic character, two of Troys four National Historic Landmarks, the Gurley Building and Troy Savings Bank, are located within its boundaries. Nine other buildings are listed on the Register in their own right, among the architects represented are Alexander Jackson Davis, George B. Post, Calvert Vaux and Frederick Clarke Withers, there are many buildings designed by the regionally significant architect Marcus F. Cummings. 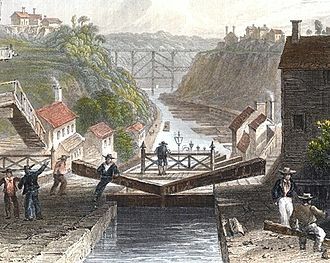 The downtown street plan was borrowed from Philadelphia, and one neighborhood, the district reflects Troys evolution from its origins as a Hudson River port into an early industrial center built around textile manufacture and steelmaking. During this period it was twice in the wake of two devastating fires, resulting in its mix of architecture styles. 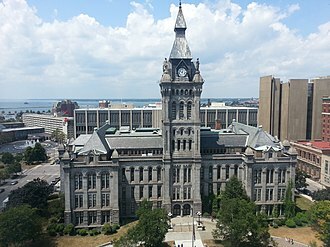 These efforts have paid off with increased attention from developers, the revival of much of the area, with the collaboration of nearby Rensselaer Polytechnic Institute, Troy is hoping to make the district a center for the development of cutting-edge technologies, a Silicon Valley of the 19th century. The district boundary was drawn to include the highest concentration of historic resources, the street plan dates to 1787 and the most recent historic building dates to 1940, making those years the period of significance. The Clermont State Historic Site, known as the Clermont estate, the Clermont Manor or just Clermont, is a New York State Historic Site in southwestern Columbia County, New York, United States. It protects the former estate of the Livingston family, seven generations of whom lived on the site more than two centuries. The name Clermont derives from clear mountain in French and was inspired by the view of the Catskill Mountains across the Hudson River from the estate, the original house was built about 1740. Robert Livingston of Clermont died on June 27,1775 and the passed to his son, Robert. Judge Livingston was a member of the New York Provincial Assembly from 1759 to 1768 and he married Margaret Beekman, daughter of Colonel Henry Beekman. Their son, Robert R. Livingston, known as Chancellor, Judge Robert died about six months after his father, on December 9,1775. 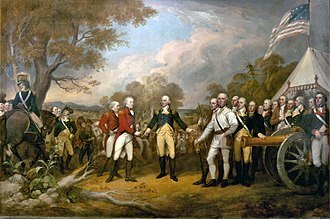 In October 1777, British ships sailed upriver from New York City in support of General John Burgoyne who was north of Albany and that same force had already stormed two forts in the Hudson Highlands and burned Kingston, New York. Major General John Vaughan led a party to Clermont and burned Livingstons home because of the familys role in the rebellion. Margaret Beekman Livingston rebuilt the home between 1779 and 1782. Robert R. Livingston became the estates most prominent resident, Chancellor Livingston administered the oath of office to President George Washington, became Secretary of Foreign Affairs, and negotiated the Louisiana Purchase. He partnered with Robert Fulton in 1807, to creat the first commercially successful steamboat on the Hudson River, the North River Steamboat, the house is now a New York State Historic Site and was designated a United States National Historic Landmark in 1972. It is a property to another National Historic Landmark, the Hudson River Historic District. Although located in the town of Clermont, its address is in the nearby town of Germantown. List of National Historic Landmarks in New York List of New York State Historic Sites National Register of Historic Places listings in Columbia County, New York Dwyer, great Houses of the Hudson River. 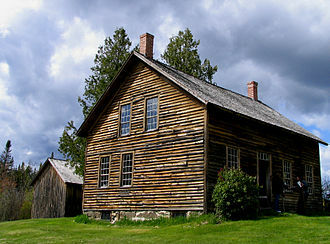 These programs were established to document historic places in the United States. Records consist of measured drawings, archival photographs, and written reports, in 1933, NPS established the Historic American Buildings Survey following a proposal by Charles E. Peterson, a young landscape architect in the agency. It was founded as a constructive program for architects, draftsmen. Guided by field instructions from Washington, D. C. the first HABS recorders were tasked with documenting a representative sampling of Americas architectural heritage, by creating an archive of historic architecture, HABS provided a database of primary source material and documentation for the then-fledgling historic preservation movement. Earlier private projects included the White Pine Series of Architectural Monographs, notable HABS photographers include Jack Boucher, who worked for the project for over 40 years. The Historic American Engineering Record program was founded on January 10,1969, by NPS, HAER documents historic mechanical and engineering artifacts. Since the advent of HAER, the program is typically called HABS/HAER. Today much of the work of HABS/HAER is done by student teams during the summer, eric DeLony headed HAER from 1971 to 2003. In October 2000, NPS and the American Society of Landscape Architects established a sister program, a predecessor, the Historic American Landscape and Garden Project, recorded historic Massachusetts gardens between 1935 and 1940. That project was funded by the Works Progress Administration, but was administered by HABS, the permanent collection of HABS/HAER/HALS are housed at the Library of Congress, which was established in 1790 as the replacement reference library of the United States Congress. It has since expanded to serve as the National Library of the United States, U. S. publishers are required to deposit a copy of every copyrighted and published work, book monograph. As a branch of the United States Government, its works are in the public domain in the US. Many images and documents are available through the Prints and Photographs Online Catalog, including proposed and existing structures, locales and designs. John Brown's grave, 1896, S R Stoddard. Partial west profile and south elevation of 1834 Universalist Church, 2010. The Ward House is in the background.